The Greg Mortimer will join the Aurora Expeditions fleet in time for the 2019-2020 Antarctica season, tripling capacity for the Australia-based cruise brand. 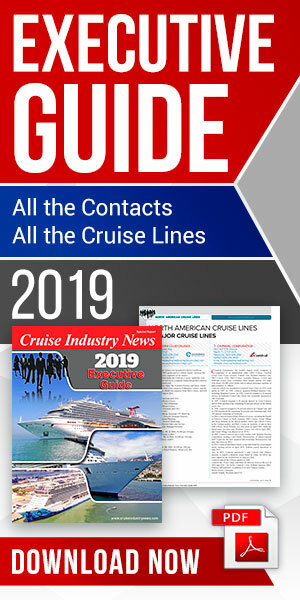 According to Managing Director Robert Halfpenny, plans had been in place since 2009, with the company recently committing to a long-term charter of the first of the new series of SunStone ships, as profiled in the 2018 Expedition Market Report by Cruise Industry News. Halfpenny, who brings a track record of working for companies in what he called “hyper-growth mode,” has already overseen the doubling the size of the Australia office, now at 25 employees, as well as hiring sales representatives in the UK and the United States. The 180-passenger Greg Mortimer, named after the company’s founder, an Australian mountaineer, will be limited to 160 guests on global and Arctic voyages, and further downsized to 120 for a premium Antarctica experience. The ship joins the company’s 54-passenger Polar Pioneer. With a smaller passenger complement, Halfpenny pointed to the “Aurora Way,” letting passengers enjoy longer duration landings instead of rushing them on and off the ship with no more than 100 allowed to land at any one time. SunStone’s X-BOW ship design will allow for a smoother sailing experience in rougher seas, while allowing the ship to also travel faster, Halfpenny said. “Even with challenging conditions, we will be able to cross the Drake Passage in a day and a half as opposed to two days. That equates to an extra landing, and places we only dreamed of reaching before. That gets the expedition team leaders really excited. One downside of the X-BOW is its large look – blocking most sight lines off the front of the vessel. To compensate, there is a forward located top deck observation lounge, and the ship designers have added hydraulic platforms to the sides of the ship, which will expand out as viewing decks. Working closely with the design team, Aurora’s expedition staff was able to get their say in key factors of the ship design, including the mud room, zodiac operation zones and other areas. Halfpenny said he saw a segmented expedition market, with five- and six-star products at the top, and the rest of the players offering a more traditional experience. That opened up an opportunity to occupy the middle, premium level of the market he said. "With the new ship we have an opportunity to lift into that middle section,” Halfpenny said. Australia is Aurora’s core market, accounting for around 65 percent of passenger sourcing. The response for the new vessel and program has been tremendous, according to Halfpenny, who said 35 percent of inventory for Antarctica 2019-2020 was sold as of April (2018). Plans are already underway to continue the expansion. In addition to the company’s operations with the Greg Mortimer and Polar Pioneer, it is a big charter customer of Coral Expedition vessels.